Blonde on Blonde's second album, Rebirth, was a more focused body of music than their debut; it also constituted the recording debut of the group's second lineup: David Thomas (vocals, guitar, bass), Gareth Johnson (sitar, lead guitar, lute, electronic effects), Richard Hopkins (bass, keyboards), and Les Hicks (drums, percussion). Whether they're doing the spacy, airy, psychedelic pop of "Castles in the Sky" or the folky "Time Is Passing," the group attack their instruments as though they're performing live, and the effect is riveting throughout, even when the melodic content flags slightly. Thomas' voice is powerful if a little over-dramatic at times, but when the band keeps things moving, there's enough richness of content to carry the album and then some; the band was probably really interesting in concert, too, based on the evidence here. And for once with a band like this, trying to encompass psychedelia, folk-rock, hard rock, and progressive rock between two covers, they don't over-reach on their magnum opus "Colour Questions," the record's 12-minute centerpiece. The group's prog rock impulses are also expressed on the album's original closer, "You'll Never Know Me/Release," which is a tour de force for Richard Hopkins' keyboard playing; unlike most of the competition, Blonde on Blonde seems not to have gravitated to the Moog synthesizer or the Mellotron, and the difference is refreshing, Hopkins' grand piano and organ speaking volumes in their own resonant language. This is the second album in the discography of this group from Newport in South Wales. 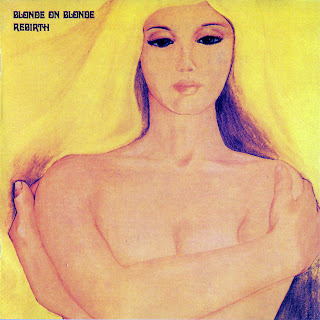 On the first and second album Blonde On Blonde played by Ralph Denyer, who after oejściu the band he formed band Aquila. The group performs music heavily inspired by psychedelic, folk. Sometimes the music is heavier, such as the composition of "Circles," where there is a hard riff and great guitar. Also additional progress can be traced. Named after the title of Bob Dylan's 1965 album, this short-lived and little known Welsh outfit stands as one of the better 'unknown' bands. Even though they enjoyed strong reviews from music critics and achieved massive exposure playing before gigantic crowds at the 1969 Isle of Wight festival (coincidently headlined by Dylan), they never managed to generate much in the way of sales. Best of all - their three albums sported a tremendously talented guitarist in Gareth Johnson. Formed in Newport, South Wales in 1967, the initial Blonde On Blonde line-up featured the talents of singer/guitarist Ralph Denyer, drummer Les Hicks, bassist/keyboard player Richard Hopkins and guitarist Johnson. Convinced they could make it in the big leagues, in 1968 the quartet packed up their gear, leaving Wales for London. Playing clubs such as London's Middle Earth generated a groundswell of publicity, with Pye Records eventually signing the band. 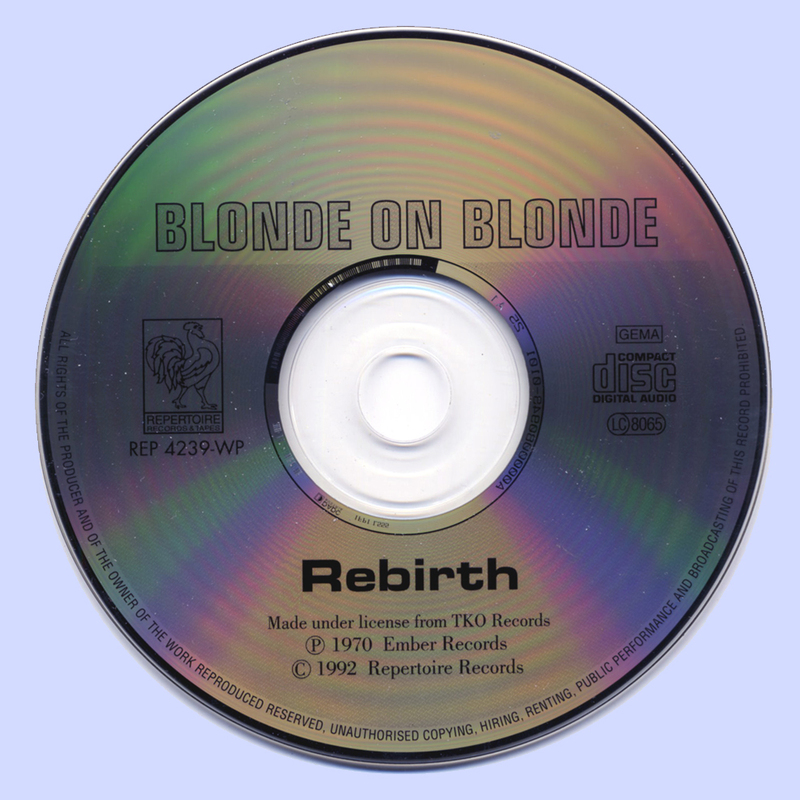 1970's Rebirth was released in the wake of a heavy touring schedule and a massive personal upheaval that saw singer/guitarist Ralph Denyer replaced by school friend David Thomas. (For some reason bassist Hopkins was also credited as 'Richard John'.) In the role of lead vocalist, Thomas was considerably more talented than his predecessor. The extra firepower provided by Thomas' versatile chops was apparent in the form of a tougher, rock oriented sound. That said, like the debut, their sophomore set was fairly varied, including stabs at Moody Blues-styled ballads (Castles In The Sky), progressive romps (You'll Never Know Me/Release) and fuzz-propelled rockers (November). As before, Johnson's versatile guitar provided many of the highlights - check out his scorching solos on Circle and Colour Question. Today all the band's releases are expensive highly sought after collectors items, not only because of its rarity, but because they contain some of the best 60s/early 70s progressive rock. John Richard (aka Richard Hopkins) just stayed with the band for another year and was replaced in mid-1971 by bassist / guitarist / banjo player Graham Davis. 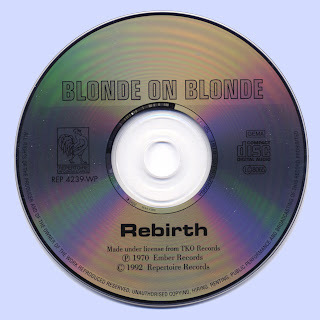 This incarnation Davis / Thomas / Hicks / Johnson Blonde Blonde recorded on October 1971 "Reflections On A Life" album (Ember NR 5058) at Rockfield Studios Monmouth although the lack of commercial success finally took its toll on the band and they were separate-ways after the release of LP,however the whereabouts of several members of Blonde on Blonde remain a mystery that is generally accepted that after the end of the band in early 1972, none of them pursued a career in music. Also many thanks to adamus67 for the well-detailed info.